I currently own a '14 Stingray and just purchased/ordered a '19 Grand Sport. 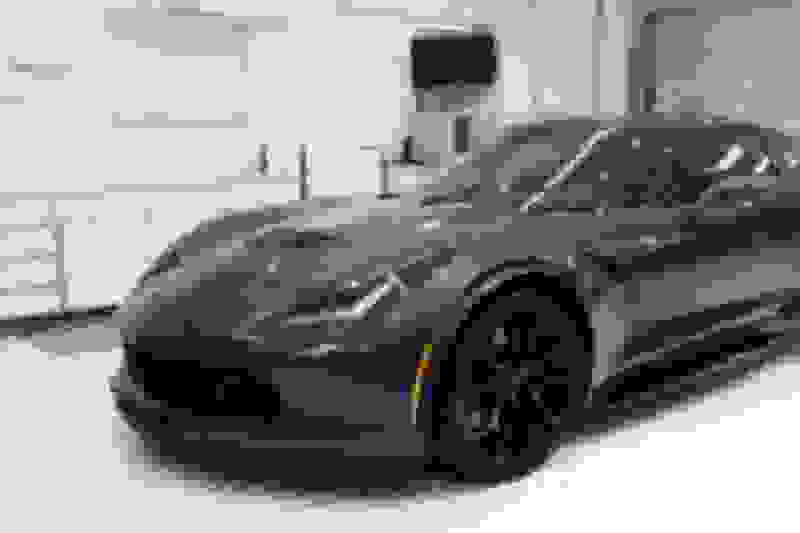 I have a question for Grand Sport and Z06 owners regarding paint protection. 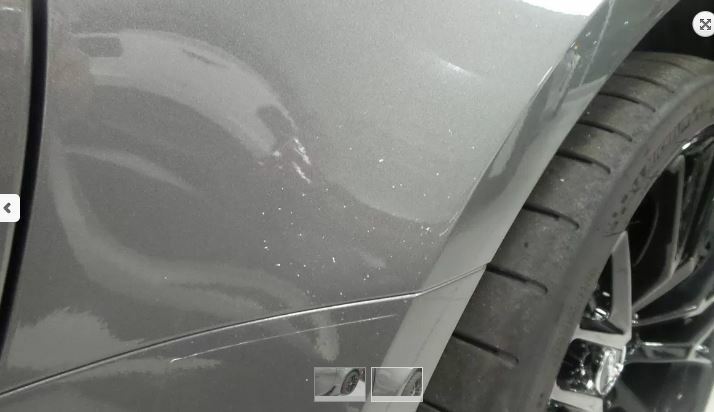 What areas, if any, need to have paint protection applied to help prevent rock chips? This car will be my daily driver. 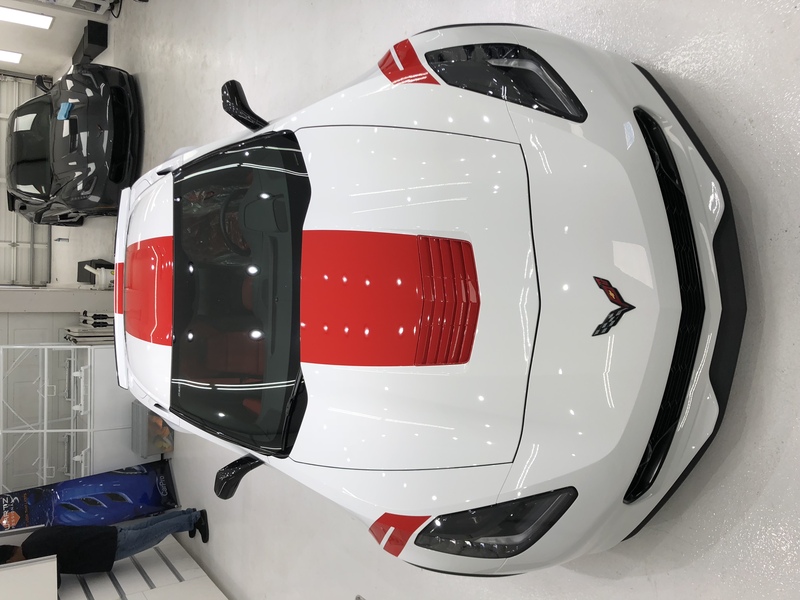 I do not have paint protection on my current Vette and don't have any real problems with paint chips. This car is my current daily driver. Any other suggestions are also welcomed. I end up doing a lot of Interstate driving, so I generally do the front ends of all my vehicles in PPF. For the GS, I did basically everything forward of the windshield...nose, headlights, splitter, full hood, and full quarters. A lot of folks do lower portion of the rear quarters, but I added splash guards, which combined with the side skirts, should keep the side chips down. 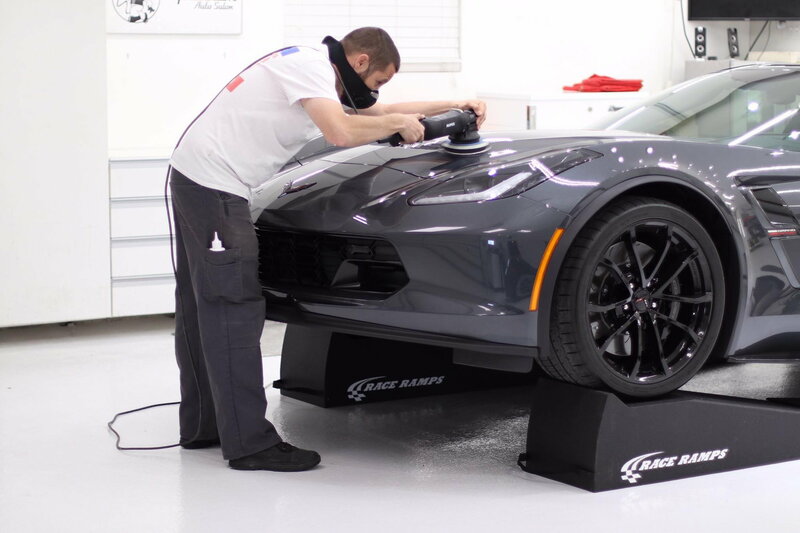 If you don't have paint protection on your current Stingray without damage there's a good chance you won't need it on your GS, especially if you add front and rear mud guards. Those along with the side skirts offer pretty good protection. I believe how and where you drive impacts your risk of damage significanty. You probably try to avoid following large trucks and don't follow too close in general. I looked at my two year old truck and used it as an example, 15-20 chips. The top of my GS is lower than the hood of my truck. I figured you have to do the entire front of the GS, the top and the rear fender flairs so what's left. I did the entire car, what the heck. I've seen pics with chips all over the rear areas but they may not have had rockers. It's all about the money, the roads you drive and what you can live with. I am really pleased with mine but you must find a great installer or it could be money wasted. This has been discussed numerous times with all sorts of opinions so there is no good answer. My opinion is you must do the front end but where do you stop? Opinions will vary greatly. When I went to the shop I had mine done there was a black P car that had chips all over the hood, they waited too long and it looked bad. What can you live with? Great installer is the key because I've seen pics of jobs I just couldn't live with. Once done you have maintenance issues. My mistake but I messed up my top and had it rewrapped this weekend. Again, what can you live with. We all have opinions on this. Good luck. Last edited by Soonere39; 03-05-2018 at 10:16 PM. That is the part I was most concerned about. All cars are susceptible to chips, but not all cars have the wider rear quarters. ... and since I live in Oklahoma City, I do not have too much problem with the sand that is sometime used on roadways during winter. I missed that...... I'm in Norman. I just purchased a new Grand Sport. I took it straight to a shop and had it wrapped with SunTek on the hood, nose, both front fenders, the rocker panels, the side skirts, both rear quarter panels, the bottom of the door jamb, and the door cups. Once it was wrapped it was sealed with C. Quartz Professional ceramic coating. I am very happy with the way it came out, and more important I feel much better knowing it is protected from rock chips! Very nice looking Grand Sport. That is the same color I am buying. Can you give what you paid for this or a ball park estimate??? And also how often should this be done? 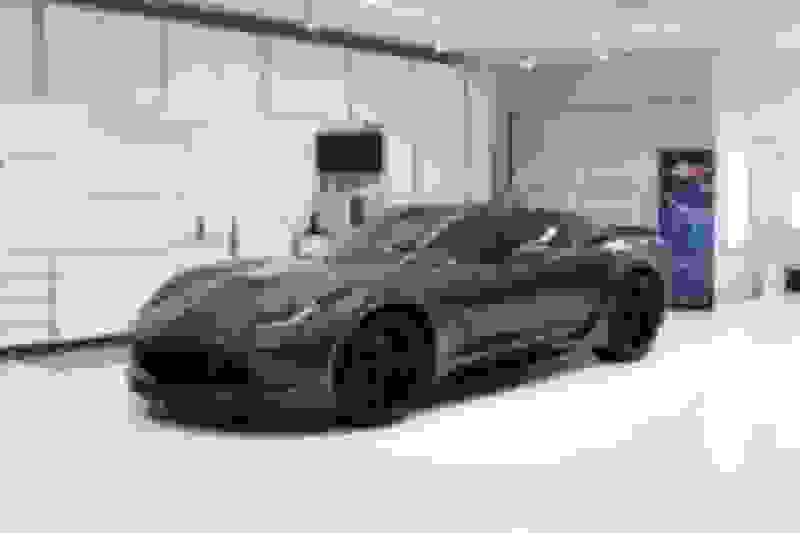 Last edited by bgspot; 03-06-2018 at 10:45 AM. Pretty sure that those with any miles on a C7 and report no chips aren’t looking hard enough. Even if there are no noticible large chips gaurantee there is severe micro abrasion in the typical areas. I have a Z06/07 and have PPF on front bumper, spoiler, mirrors, and headlights. GM splashguards front/rear, full length skirts and cleartastic on upper rear fenders...some still gets through. 2017 GS, just broke 9K and it's my DD. GM front and rear mud guards and factory 3/4 skirts. Even with the crappy Vegas roads and blowing dirt, no chips so far. I'm sure it will happen at some point, just think the $1-4K is better spent fixing them if/when it happens. I live in a suburb of Los Angeles. Stuff like this is crazy expensive out here. I have seen on this forum the costs are much more reasonable in other parts of the US. The shop did a complete paint correction on the clear coat prior to the Sun Tek being applied. Once that was done, they applied two coats of the C. Quartz Professional sealer, then buffed it out. When I priced out the Sun Tek I was quoted $2,500. Just the C. Quartz Professional was $1,000+. I ended up paying $3K total. The Sun Tek is warrantied for 10 years. I was told I should not have to wax the car for two years. This is my first experience paying for protection like this. 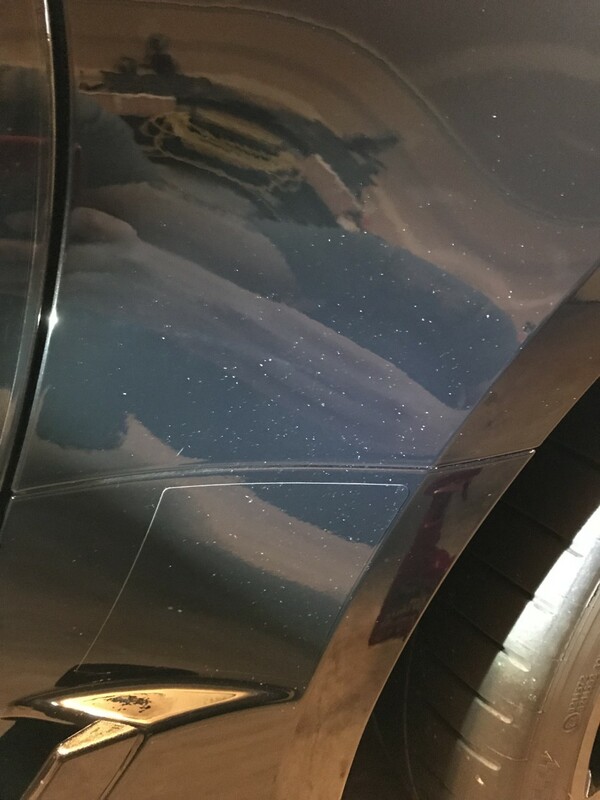 My '98 C5 had rock chips and sand blasting, and it drove me nuts. We shall see how good this protects my front end. I will say, though, the shine is so deep and it looks incredible. The photos taken in the shop make the car look much lighter than it really is, because of all of the lighting and white epoxy floors. The shop says the lights and floor show all of the flaws in the paint and helps them do a much better job on the car finish. bigblock427, I did what Mad_Dog did: essentially taking it off the Corvette delivery truck straight to a shop for XPEL Ultimate and Ceramic Pro Gold Package (and Interior CP) before the car (2018 Grand Sport) hit the street. Sooooo many times have I been glad I did because of one thing or another. I would encourage anyone with the desire to keep the vehicle in as good shape as possible to consider doing something similar. I think the peace of mind alone is well worth it. I had Xpel installed at the dealer before I picked my car up for the 300 mile drive home in March in the Northeast. I had everything but the roof, rear hatch & rear fascia covered. I have own a 2017 Grand Sport and had the entire front end protected with PPF from day 1. I currently have 6k miles on the odometer without a single front end rock chip. The car is Tuxedo Black and rock chips show very easily. 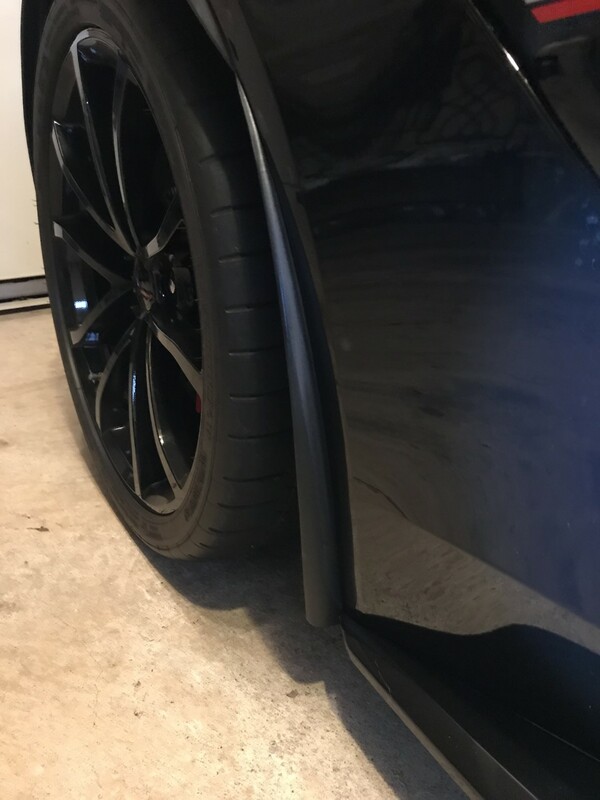 However, because I installed the ACS extended front mud flaps and have the side rockers from the factory, along with the factory applied lower rear quarters PPF, I opted out of having PPF applied to the rear quarters... here's the 6k mile result.. I'm in SoCal, too, but on the other side of LA in OC. Where did you get the work done? I just got a GS and am thinking about the same thing. Thanks. Last edited by IAIA; 03-06-2018 at 04:31 PM.